I have pointed out that PNG LNG royalties are actually paid for by the taxpayers of Papua New Guinea (“PNG“) and not the PNG LNG Project (see here). This is an unfair transfer of wealth from: (i) the people of PNG to developers of our natural non-renewable resource; and (ii) those outside the PNG LNG project area, which is most of the population of PNG, to those fortunate to be in the project footprint. A true royalty arrangement would be paid for by the companies that exploit our non-renewable resources for their commercial gain – this does not happen with the PNG LNG project. There has been a fair amount of discussion in the media about the proposed sale of additional equity in the PNG LNG by the Independent State of Papua New Guinea (the “State”) to PNG LNG landowners and PNG LNG provincial governments (the “Additional Equity Beneficiaries”). What has escaped discussion is how the O’Neill Government’s unilateral decision to revise the terms of the Umbrella Benefit Sharing Agreement (the “UBSA”) imposes another inequity on all our people that are not from the areas that the PNG LNG Project sits in. The O’Neill Government has directed the transfer of a total of US$841.6 million, or K2.7 billion, in wealth from the rest of PNG to those fortunate enough to be from the 4 provinces which lie in the PNG LNG footprint – the Additional Equity Beneficiaries. I ask is this right? Is this just and fair? The title above appears in the assertion part of the preamble of our State Constitution. Our Constitution sets as the 4th Directive Principle that our natural resources be used for “the collective benefit of us all, and be replenished for the benefit of future generations”. Natural non-renewable resources such as oil, gas, gold and copper are natural assets of Papua New Guinea. When these natural assets are exploited – that is extracted, processed and sold – they are converted from a natural asset to a financial asset. This financial asset should be then used for the collective benefit of all Papua New Guineas both the current generation and those yet to come. The benchmark model for how this could work is the Norwegian sovereign wealth fund. This Fund has accumulated the proceeds of the sale of oil and the investment earnings and now the value of this Fund exceeds the GDP of Norway and made theoretical millionaires out of all Norwegians (see here). Sadly, the PNG Sovereign Wealth Fund (SWF) for all the grand talk by the current Government has yet to be established despite Peter O’Neill introducing the SWF law in Parliament over 5 years ago (see here). In the 2009 Umbrella Sharing Agreement a deal was struck for the sale of 25.75% of the shareholding in Kroton No. 2 Limited, now renamed Kumul Petroleum (Kroton) Limited). (“KPKL“) (see here). KPKL is a special purpose vehicle through which the State participates in the PNG LNG Project. There was a derivative valuation of KPKL based upon the PNG LNG Project (hardly surprising as the only asset KPKL will ever own is its participating interest in the PNG LNG Project). The deal struck implicitly valued the PNG LNG Project at US$24 billion. Each 1% equity of the PNG LNG Project was valued at US$ 240 million. Considering the capital cost of around US$ 16 billion (before the project cost increase of US$3.3 billion, see here), this suggests a discounted value, at the time of the UBSA, of projected net profits of US$ 8.3 billion. This is an important point, which I shall return to later – when you buy a company the asset you are buying is the future cash flows of the company. As Wapu Sonk, Managing Director of Kumul Petroleum Holdings Limited, explained in a newspaper report, the partial sale of KPKL negotiated under the UBSA was only an option meaning that the Additional Equity Beneficiaries could elect to buy the shares or forgo it. This option was only valid for a 6-month period in the first half of 2016. It expired without the option being exercised and so has lapsed (see here). There is no provision in the UBSA that deals with the sale of KPKL after the option has expired. To amend the UBSA would surely require another coordinated development forum to be held; something that is perhaps best avoided. So how much indirect PNG LNG equity would landowners get? 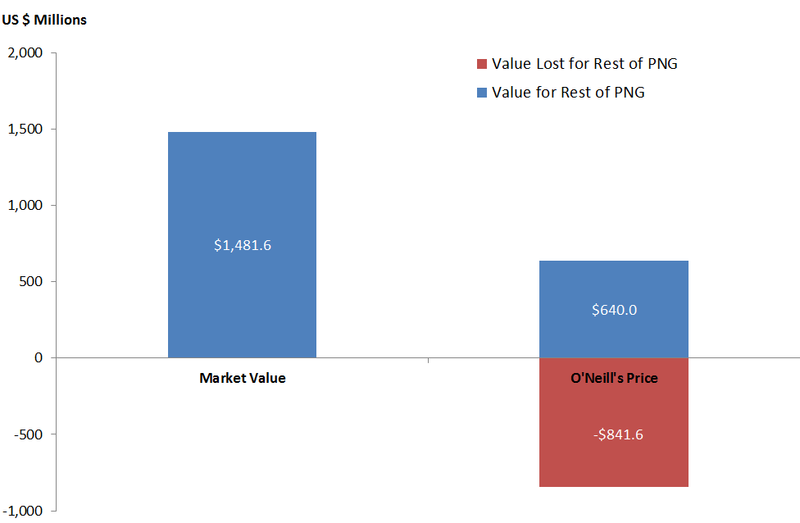 The media discussion often talks about the Additional Equity Beneficiaries buying an additional 4.27% PNG LNG equity. This is not correct. What is being bought is 22.75% of KPCPK. This then gives the landowners an economic interest equivalent to 22.75% of the total project interest held by KPCPK. PNG LNG is an integrated project comprising several gas fields, pipelines and the processing facility. The project equity stake is determined by the ownership of each gas licence weighted by the contribution of each gas field to the total project gas volumes. Given KPKL’s partial ownership of each gas licence it has an overall PNG LNG equity of 16.57% (see here). So 22.57% multiplied by 16.57% is 4.27%. This is how the 4.27% figure often cited is derived but it is an indirect interest not a direct equity interest in PNG LNG. 22.75% of KPKL is equivalent to an economic interest of 4.27% in the PNG LNG Project. So US$ 240 million multiplied by 4.27 gives a total purchase price of US$ 1.024.8 billion agreed in the UBSA. We are informed by Wapu Sonk that the O’Neill Government after the UBSA option expired unilaterally extended both the period of the option to buy and reduced the sale price (see here). I have not seen public statements on the matter from the Board of Directors of Kumul Petroleum Holdings Limited, the owner of KPKL. Company Board Directors have a statutory and fiduciary duty to protect a company from any significant loss of value. In Exhibit B the change in valuation is shown and particular the transfer of value between Landowners and the rest of PNG is shown. Using Bank of PNG’s exchange rate on 20 April 2017, the wealth that is proposed to be transferred is US$ 384 million or K 1.2 bilion (under the terms of the UBSA). Now that the UBSA option has expired it is a fresh negotiation and we should look at the true market value of KPKL to assess what the true value of wealth being transferred is. We can examine the value of PNG LNG project by using the market capitalization of a publicly listed company with an equity stake in PNG LNG, such as Oil Search, and work out how that value can be attributed to its PNG LNG holding. An alternative is to look at past sales of equity in the PNG LNG licences to work at some reference values. But usually, it is the estimated net cashflows of the company that are used for the valuation exercise. I will rely on the latter two. I make clear that I do this only for the purpose of illustrative analysis and this information should not be used as the basis for any investment decisions. In 2008 AGL Energy Ltd sold a 3.6% stake in PNG LNG for US$ 800 million or A$ 1.1 billion (see here). This gives a 2008 valuation of a 1% equity interest in PNG LNG of US$222.2 million. This is slightly below the UBSA price agreed of US$ 240 million. The AGL divestment was done before loans for the PNG LNG Project were signed in 2009 but it was clearly understood that there would be a 70:30 debt-to-equity financing mix for the Project (for example see here). Moreover, the purchase was done by Merlin Petroleum Company using their pre-emptive rights (see here). So the buy was an informed purchase by a company which fully understood the details of the PNG LNG Project and the proposed debt-to-equity funding structure. On this basis it would seem that a negotiated price of US$240 million is reasonable. compute the value of the UBSA agreed optional equity by taking 25.75% of the value calculated in step 1. Using information in the public domain we can try to piece together an estimate of the value of KPKL. It is reported that in 2013 the “PNG Government expects its annual revenues from PNG LNG to be US$ 600m (K 1.7 billion) to US$ 775m (K 2.2 billion) until early next decade and then, with the development costs depreciated, to rise raise rapidly to around US$1.58 billion (K 4.5 billion)” (see here). I will concentrate on the low dividend profile with dividends of US$600 million for years 2017-2021 and US$ 1.58 billion for years 2022 onward. Using this information we can compute the net present value of the cashflow of KPKL for the 27-year period from 2017 using a discount rate of 10%. The value of KPLH is a staggering US$ 10.9 billion or K 34.6 billion. So the KPKL equity option has a value of 25.75% of this amount, which US$ 2.8 billion or K 9 billion (using the lower dividend stream). In other words the value today of all future income from a 4.7% interest in PNG LNG is worth US$ 2.8 billion, or K9 billion, and this is after the cost of project debt financing and equity financing has been removed from the dividends streams. To be clear the project equity financing (of 30% of total project development costs) has already been paid mostly by the exchange (or sale) of the State’s 14.7% equity stake in Oil Search to IPIC. Repayment of the 70% project debt has first claim on the project net income before distributions so the annual dividends from PNG LNG are only paid to KPKL after the PNG LNG project debt has been serviced. The valuation does depend crucially on the LNG price received. As we can see from Exhibit C the price of oil has fallen since 2013 so some adjustments would need to be made to the expected KPKL cashflow going forward. It is unlikely that the estimates in 2013 would have used the oil price currently prevailing then but as we have no better information to rely on we assume that the dividend stream moves commensurately with oil price changes. You may wonder why I use oil prices rather than LNG prices. The price for gas from the PNG LNG Project is determined by a linear formula linking LNG prices to average oil prices in Japan. So LNG prices move in line with oil prices. 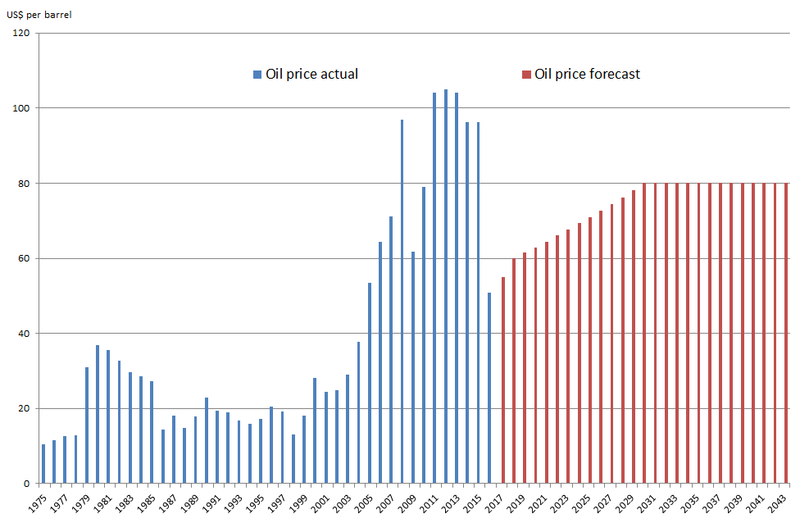 In Exhibit C, the blue bars show actual average oil prices whilst the red bars are the forecast oil prices sourced from the World Bank (see here). I’ve interpolated prices for the period 2016-2019 using an average geometric growth rate and then held prices constant from 2030 onward as the World Bank forecasts don’t extend beyond 2030. For the purposes of illustration only, I assume that dividend stream (cited above) fall commensurately with the oil price reduction from the 2013 level. This allows me to compute the valuation of 22.75% of KPKL using the net present value of the new projected cashflow with a discount rate of 10%. 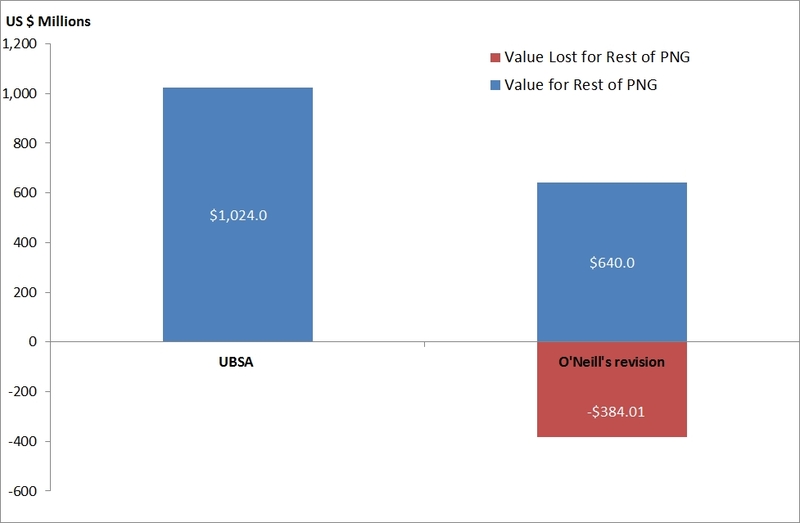 The results are shown in Exhibit D.
So the O’Neill Government has agreed to the Equity Beneficiaries acquiring from the rest of PNG a value of around US$ 1.5 billion for an outlay of US$ 0.6 billion, that is a transfer of wealth of just under US$ 1 billion. This is illustrated in Exhibit A at the top of this webpage. Remarkably, the payback period for Additional Equity Beneficiaries would be around 5 years for the purchase even after allowing for modest total dividend of US$ 25 million (or K 80 million each year to project landowners and provincial governments. Thereafter full dividends will be of the order of K 700 million for the subsequent 22 years. KPKL is owned by Kumul Petroleum Holding Limited, an incorporated company. The Companies Act of PNG sets out statutory responsibilities of Directors. Why would the Directors of Kumul Petroleum Holdings Limited agree to such a huge loss in value from its major asset? This seems to be a breach of the statutory and fiduciary responsibilities of these Directors. Why have the boards of directors of Kumul Petroleum Holdings Limted and KPKL approved such a large reduction of the sale price of a quarter KPKL thereby eroding the value of both entities’ balance sheets? Is there is a breach of duties and responsibilities by both sets of directors in not protecting the assets of the company they are responsible for? Are directors of Kumul Petroleum Holding Limited and KPKL personally liable for the loss of value that may be suffered, if there is a breach of their statutory duties? If members of the National Executive Council directed the terms of the (as yet to be consummated) sale are they now considered shadow directors of the two companies and personally liable for any losses suffered froma breach of director duties? K 120 million for business seed capital grants. This is a total of K 1.78 billion paid for by the tax-payers of Papua New Guinea, most before gas taxes and dividends were received. In addition over the project life royalties totaling in the billions of Kina will be fully paid for by taxpayers of Papua New Guinea. Project development levy also totaling in the billions of Kina will be partially paid for by the taxpayers of Papua New Guinea. 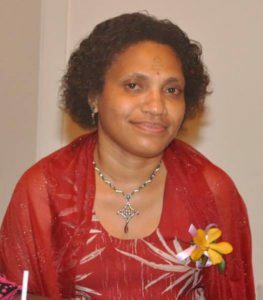 It is unjust that we forsake the founding values of our country embedding in our Constitution to transfer further wealth of nearly K2.7 billion from most Papua New Guineans to a few that have been lucky to have natural resources created by God under their land or to have a pipeline or plant site situated on their land. This goes against the grain of our Melanesian culture and against the values enshrined in our Constitution. Why is that we allow our people to be caught in a zero sum game when the bigger issue is why we continue to allow our country’s wealth to be exploited by developers at our expense? Is it not unreasonable to expect our Executive Government to govern for all Papua New Guineans? All I seek is a fair distribution of our country’s non-renewable resource wealth between our people and resource project developers.